Marsha N. Wittink, M.D., M.B.E. Dr. Wittink is the medical director of the Inpatient Medicine in Psychiatry (IMIP) unit at URMC. IMIP uses a multidisciplinary approach to care for hospitalized patients whose medical care may be complicated by concomitant mental health concerns. The team of nurses, social workers, physicians and mental health providers works together to deliver compassionate care targeted to patients' needs. Dr. Wittink is also involved in medical student and resident teaching focused on integrating medical care . She is passionate about working with patients and families to determine health goals and improve overall quality of life. 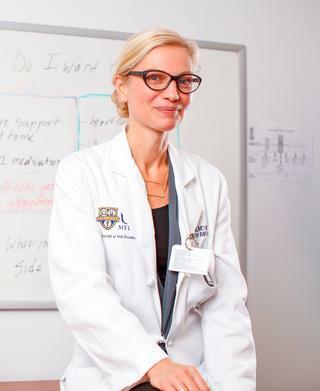 Dr. Wittink is Associate Professor in the Departments of Psychiatry and Family Medicine. Her research efforts are driven by her clinical experiences as a primary care physician and hospitalist caring for patients with concomitant medical and mental health needs. She has been awarded grants from the National Institute of Mental Health (NIMH) and the Patient Centered Outcomes Research Institute (PCORI) to develop strategies to elicit and incorporate patient priorities into care. She joined the UR faculty in 2010 to work with other researchers interested in health care decision-making and patient-provider communication. Dr. Wittink is currently developing infrastructure to study and improve health outcomes for patients with serious mental illness. Loh KP, Mohile SG, Epstein RM, McHugh C, Flannery M, Culakova E, Lei L, Wells M, Gilmore N, Babu D, Whitehead MI, Dale W, Hurria A, Wittink M, Magnuson A, Conlin A, Thomas M, Berenberg J, Duberstein PR. "Willingness to bear adversity and beliefs about the curability of advanced cancer in older adults." Cancer.. 2019 Mar 28; Epub 2019 Mar 28. Jayadevappa R, Chhatre S, Gallo JJ, Wittink M, Morales KH, Lee DI, Guzzo TJ, Vapiwala N, Wong YN, Newman DK, Van Arsdalen K, Malkowicz SB, Schwartz JS, Wein AJ. "Patient-Centered Preference Assessment to Improve Satisfaction With Care Among Patients With Localized Prostate Cancer: A Randomized Controlled Trial." Journal of clinical oncology : official journal of the American Society of Clinical Oncology.. 2019 Mar 12; :JCO1801091. Epub 2019 Mar 12. Pudalov LR, Swogger MT, Wittink M. "Towards integrated medical and mental healthcare in the inpatient setting: what is the role of psychology?" International review of psychiatry.. 2019 Mar 1; :1-14. Epub 2019 Mar 01. Author List: Duberstein, P.; Wittink, M.